Lower South Falls is one of four waterfalls in Silver Falls State Park featuring a trail which passes behind the falling water. Unlike the other three, the confines of the overhang behind the falls are quite cramped, and as such the trail has been constructed bordered with a very tasteful stone wall that blends into the landscape quite unobtrusively, which gives the falls a bit of a rustic feel more typically associated with areas like the Columbia River Gorge.With a drop of 93 feet the falls.There are great views from below the falls on the east side of the creek. On the west side of the creek, the trail immediately climbs about 150 feet of switchbacking, irregular stairs. The extra elevation creates interesting views of the waterfall from above. Silver Falls State Park straddles Highway 214 east of Salem and can be reached from either the north or south. From Salem, exit Interstate 5 onto Highway 213 eastbound and proceed 10 miles to Silverton. In Silverton turn right (south) onto Highway 214, following signs pointing to Silver Falls State Park, and drive another 15 1/2 miles to the South Falls area of the park. Alternatively, from I-5 in Salem drive east on Highway 22 to its junction with Highway 214, then follow Highway 214 for another 16 miles to the South Falls area. 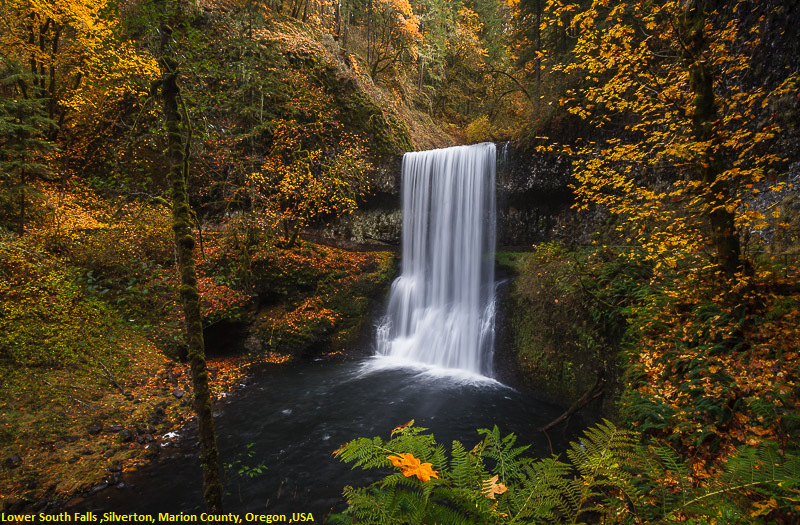 From the parking lots, follow any trail leading to South Falls and then proceed to the base of the falls (just under half of a mile), then head downstream along the Canyon Trail for another three-quarters of a mile to where the trail passes behind Lower South Falls.